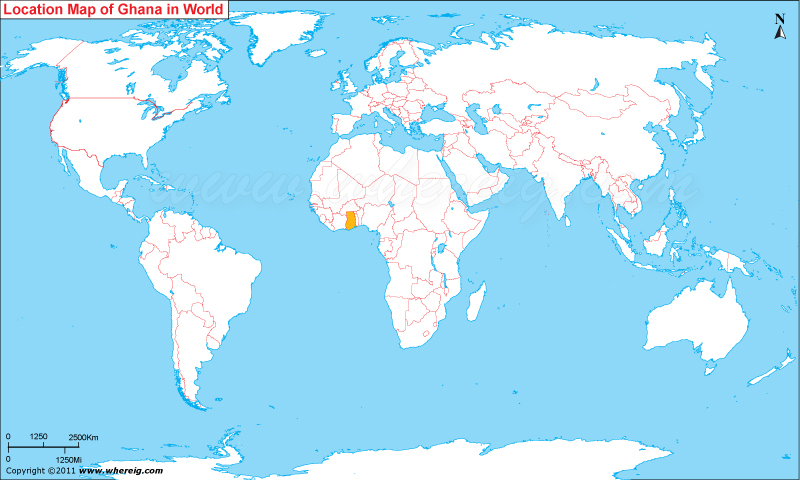 About Map: Map showing where is Ghana located in the World. The given Ghana location map shows that Ghana is located in the western part of Africa continent. Ghana map also shows that the country shares its international boundary with Ivory Coast (Côte d'Ivoire) in the west, Burkina Faso in the north, and Togo in the east. Besides, the country has also coastline opens into Gulf of Guinea in the south. The name of country i.e. Ghana is not given randomly rather it is given after the Ghana Empire. In fact, Ghana means ‘Warrior King.’ However, after its independence, Ghana has constituted as a parliamentary democracy. Surprisingly, Ghana is the second largest producer of cocoa in the entire world; hence, besides cocoa, the other major contributors of Ghana economy are – gold, oil, timber, electric power, diamond, bauxite, and manganese. Above all, Ghana is home of Lake Volta; it is the largest artificial lake in the world in terms of surface area.